Sunday's AFC Championship game between New England and Denver looks to be a massive ratings success, just month's after the two teams produced the league's highest November prime-time ratings in 17 years. The Patriots' overnight rating last Sunday of 19.1 was far short of the top weekend-rated Broncos-Chargers game, which earned a 25.7 rating. When the Patriots faced the Broncos earlier this season on November 24 for NBC's "Sunday Night Football, the game earned a 17.0 overnight rating, and a 28 share. The strong rating marked the highest November ratings for a prime-time game in 17 years. Ratings are the percentage of television homes in the U.S. tuned into television, and a share is the percentage of televisons in use that are tuned to a specific program. How do the two markets rank? The Boston and Denver media markets rank seventh and seventeenth in the U.S. respectively. The Boston market has 2,433,040 TV homes, while Denver has 1,574,610 according to Nielson. 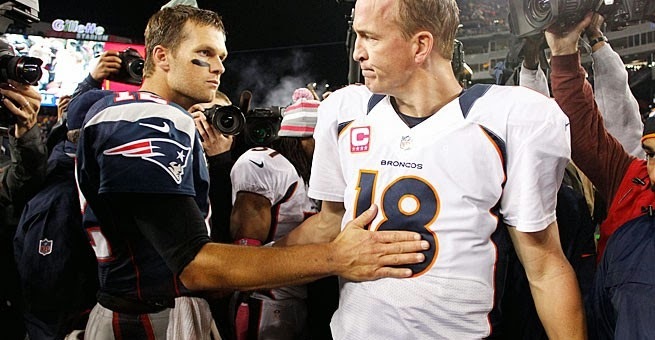 Sunday's 3 p.m. game at Sports Authority Field at Mile High in Denver should put up great numbers, as Tom Brady will be facing Peyton Manning for the 15th time. Ratings this year for the AFC title game could top last year's 47.7 rating for the game between New England and Baltimore on January 20, 2013. With two of the most noticeable personalities in sports facing off, Sunday's game has great potential for an enormous ratings success.